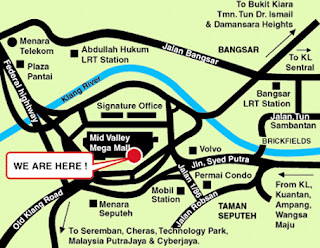 Mid Valley Mall is located in between the Federal Highway and Jl Bangsar. Way back when it was constructed, everybody dismissed it as a failure because of its proximity to Federal Highway – the place where they breed traffic congestions. But NOW, the congestion to get into Mid Valley Mall is even worst that the federal highway itself , and thats a show of popularity for Mid Valley Mall. What can you get here that you cant get elsewhere? Nothing – they have everything that you can get elsewhere, its all concentrated under one roof. Anchor tenants here are Carrefour, Jusco and Metro jaya. Mid Valley Mall also houses a 36,000 square foot MPH bookstore, an 18-screen multiplex cinema, the largest in Asia, as well as a 38-lane bowling alley. And in between you have small retails selling fashion clothing and accesories, food court and restaurants, pharmacies, electrical shops, banks, hardware store and many many stores, too numerous to mention here. There is a shopper’s shuttle that leaves from the Ritz Carlton and then picks up guests at the J.W Marriot (J.W Marriot & Regent), Istana Federal (Federal & Century), Allson Genesis and Shangri-La then stops at Megamall. Check with Segar at the Ritz Carlton concierge to see if the shopper shuttle is still running (schedule below). To get to Mid Valley from KL Centre, take the monorail to KL Sentral and cross the road to take the Putra to Bangsar Station (one station away at RM1). From Bangsar station, take the exit to your left where you will see a bust stop towards Mid Valley. You could take the free shuttle (Trinton Bus) direct to Mid Valley South Court. Do check the frequency of the bus which could be at an interval of 30 mins to an hour. Alternatively, take a taxi. About a 10RM taxi fare from Bukit Bintang.